UPDATED February 21, 2019 – Arthritis is an illness that covers over 125 unique problems and auto-immune diseases that can trigger severe joint irritation and discomfort. Stem Cell Transplants for Arthritis can help manage and eliminate arthritic condition in a permanent,safe and effective way using enhanced stem cells. Arthritis is not a single condition but a family of over 100 types conditions referring to joint disease or joint pain. The two main types of arthritis are rheumatoid arthritis and osteoarthritis. The disease affects people of all gender, age and racial backgrounds and is considered one of the leading causes of disabilities in the world. A diagnosis of Arthritis occurs most commonly to women as they begin to age. Symptoms often come and go and can range from mild, moderate to even severe. Patients often ignore the symptoms for years but usually find that the disease degenerates even further over time causing severe chronic pain and the inability to do normal day to day activities such as walking, climbing stairs or exercising. If left untreated, Arthritis will cause permanent and visible joint damage such as knobby/knotted finger joints. For those that do not display symptoms, an MRI or Xray is needed to see the full damage of the disease. 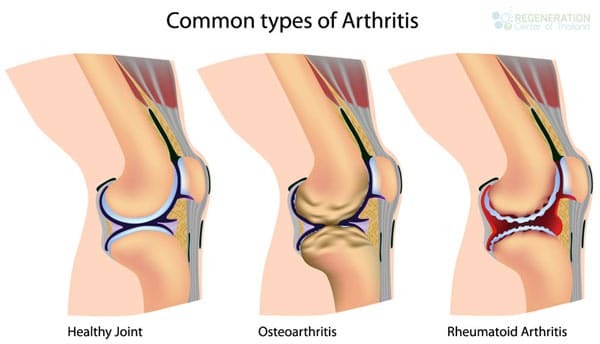 Some types of severe arthritis will also affect the patients heart function, vision/eyes, Impaired Kidney function, skin, lungs and circulatory system. Genetics or Family history – Arthritis can run in families, so its very likely that patients who have parents or siblings with the disorder will also develop arthritis. Genes can also make us more susceptible to external/environmental factors that can trigger onset arthritis. Gender – Women are much more likely to develop rheumatoid arthritis than men while most patients who get diagnosed with gout ( another type of arthritis) are men. Obesity/Body Weight – Carrying excess weight puts extra stress on joints such as knees, spine or hips. Therefore overweight people have a much higher risk of developing arthritis as they age. Age – The risk of acquiring many types of arthritis increases as we age. 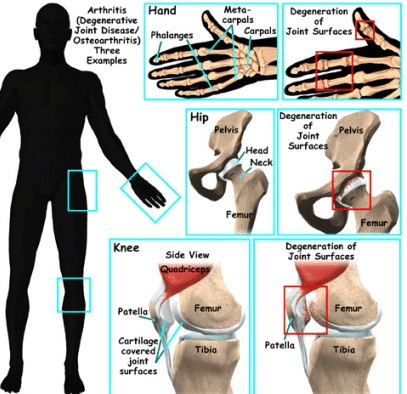 There are numerous well-known types of joint arthritis in the world today. The 2 main types of joint arthritis are osteoarthritis and Rheumatoid Arthritis. RA or Rheumatoid joint inflammations are a constant ailment. RA starts with irritation, tiredness, joint discomfort and or stiffness. As this problem gets worse over time, you will experience frequent flu-like symptoms and muscle pains. Osteoarthritis on the other hand is a “wear & tear” problem. Osteoarthritis is a lot more common with age and now manageable with Stem Cell treatment for Osteoarthritis. Osteoarthritis begins with stiffness and joint discomforts and is treatable with stem cell treatment for osteoarthritis. Additional types of joint inflammations that are treatable in a short trip to Thailand consist of:. Mesenchymal Stem Cell transplants for bad Joints and Arthritis is also a good alternative to having invasive knee replacement surgery or hip replacement surgery. 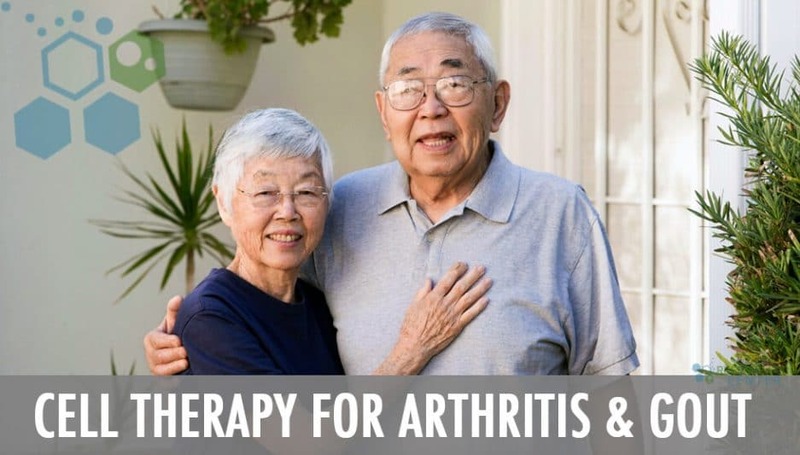 The regeneration center offers a safe and effective cell based treatment for degenerative Arthritis that can quickly help relieve pain,problems and unnecessary physical suffering. Usually most adult females and men in between 40 to 65 establish some type of cartilage and joint problems that results in osteoarthritis. These conditions can safely be treated today using MSC+ Cells for Joint inflammation and Arthritis. The integrity of your cartilage could slowly wear down to the point of daily mild to severe pain. Osteoarthritis may also affect the hips, knees, spinal column and most particularly the finger articulations of your hands. Some people encounter extreme stiffness and pain and in extreme cases, the degenerative joint condition of rheumatoid arthritis can easily result in extreme deformities in the affected locations. Our treatment center offers an affordable method of managing your arthritis conditions and can assist your body to heal normally thereby eliminating the pain. 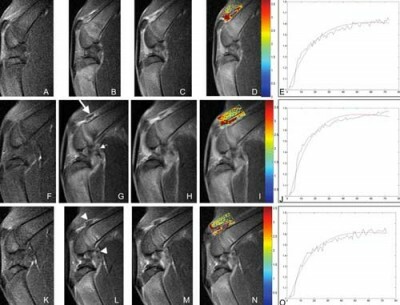 The protocol for treatment of Arthritis in 2 phases using Mesenchymal Cells with platelet Rich plasma or PRP. Platelet rich plasma is your blood plasma that is combined with growth factors and to create a higher percentage of blood platelets. Cellular therapy for Arthritis and PRP are usually combined to increase the normal recovery process in the damaged tissues of your body. PRP is an essential element for the cell homing process and instructs the cells the body that it’s time to commence the natural healing process. RA or Rheumatoid arthritis is an orthopedic disease that normally takes place in men and women over the age of 40. RA is a long term degenerative ailment that has significant effects on the joint tissues in the hands, feet, and arms. People dealing with rheumatoid arthritis may typically live with the disease for years without even knowing they even have it. As RA progresses, the severe destruction of your joints will certainly get considerably worse. Our Protocol for treating Rheumatoid, Spinal arthritis and Osteoarthritis offer a high success rates and long term improvements. We take a natural regenerative approach and use enhanced Mesenchymal cells (expanded) with paracrine cell signaling growth factors to rapidly and successfully fix the impaired cells in your body. Cell regenerative medicine allow the replacement cells to travel throughout your body through a process known as “homing” Homing means the cell are actively “homing” in on distressed/injured areas throughout your body. (22258456) To regenerate your joint cells our doctors first need to harvest the cells from your autologous fat,peripheral blood or marrow then separate and expand the mesenchymal cells. (23685840) If a patient is older or has an underlying medical condition that will not allow us to take stem cells from his/her body, we will use matched allogeneic stem cells. Rehabilitation Post Treatment: Physical Rehabilitation in Bangkok is optional but highly recommended. Complete physical rehab services post-therapy can be provided upon request for 2-3 hours per day and up to 5 days per week. Total Treatment Time Required : estimated around 2-3 weeks (depending on type and seriousness of condition). Medical and travel visas for extended stay accommodations at a hotel or extended stay apartment for the patient and family can also be provided upon request. The entire MSC+ Stem Cell treatment for arthritis and Joint inflammation will require 12-21 days in total. Due to the varying degrees of severity our orthopedic team will need to evaluate potential patients so that an appropriate protocol can be established. Upon approval, a detailed treatment plan will be provided that will includes the specifics such as exact total number nights required along with the total medical related costs. To begin the evaluation process for our multi-stage arthritis treatment protocol please prepare your recent medical records such as Radiology scans w/ Blood tests and contact us today. I am 39 years old female and been diagnosed with Psoriatic arthritis since October 2016. I was on alot of Methotrexate and DMARDs since, but the medications are causing a ton of side effects without any real improvement. the painis driving me completely nuts I want to try other alternative treatments. wondering are stem cells effective? what is the best treatment for me?? I have arthritis in different forms (osteoarthritis and rheumatoid arthritis) in my fingers, neck, knees. But the worst affected is my spine for which I am now taking Fentanyl. I was due to have an operation but did some research and found your website. Stem cell research may be a less invasive treatment. The Fentanyl doesn't seem to control the pain. I will need treatment to both my back and neck. I have results of MRI to both areas. My query is: is stem cell treatment effective for these areas ? What is the approximate cost for treatment only (without accommodation and flights). Thank you. Looking for effective SCT for Right hip OA. Have X-rays fairly recent. Joint space reducing slowly. Taking excellent range of supplements, topical DMSO, Boron, HA. Magnesium oil, borage oil, pomegranate molasses, turmeric, ginger, h202 therapy and loads more. Believe I have slowed down the degenerative process. THR left hip 2013. Disastrous - wrong size. Told I've managed it myself with exercise and skeleton adjusted. I'm athletic - . Do Pilates and horse ride after 20 years yoga. But need lots of rest, prone! Slim, fit, but have mitochondrial clumping (3 years ago - probably resolved with magnesium, zinc , coq10 etc as energy levels better) I self educated. Bloods normal now. Could not tolerate BSM/ACV. Also Have to force self with turmeric - it makes me gag. Homeopathic colocinth and belladonna for hip pain. Was thinking of Cuba or Moscow, but read Poland and Thailand of interest, Plse more info for my particular case. Asked for HA here 3 years ago, but we are the 3rd world here in the UK. for OA. Keeps the surgeons in business. I hv RA and it moves around my body. I don't think I hv any bone damage yet. Judt wondering what and where would you inject since my pain is here and there . And I understand that until today there was no cure for RA. And nobody talks about stem cell. Will it permanently cure my RA? i did a tendon debridement on my left ankle 2 years ago. ever since my left ankle has always feel inflamed and slight pain. im interested in doing stem cell on my left ankle but would like to enquire about the cost of the treatment. Baker's cyst operation after both kness get stiffiness and continuous pain.after x ray showing both kness are Osteoarthritis OA PROBLEM and bone spurs.pls comments your valuable advise is it requre operation or there is any medicine like stem cells that help. Please can you tell me how my body will responded to stem cell therapy for arthritis in my hips? I dont want to get hip replacement or resurfacing so im hoping stem cells can help. My doctor in London told us about stem cell therapy but they cannot offer to us. Please tell me if you can help. I have MRI and his reports. 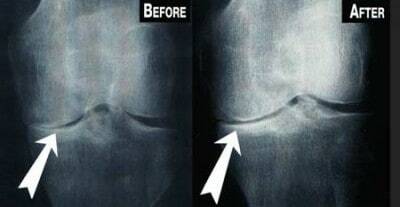 Hello Mr Gordon, We have emailed you with more information about stem cell therapy for knee arthritis. Thank you. Hi Albert, Thanks for contacting us about stem cell therapy for knee injuries and osteoarthritis. re:yellow acid injections - Are you referring to Ascorbic Acid Injections? We will email you with some basic information along with instructions on how to submit your medical information for our doctors to review and advise.